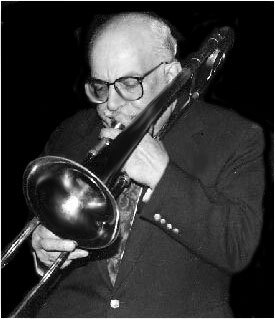 Zalman "Porky" Cohen, the brash, big-toned trombonist who capped a long and varied career by performing with Grammy-winners ROOMFUL OF BLUES from 1981-1987, died early this morning in his hometown of Providence, Rhode Island of complications resulting from a stroke. He had been experiencing health setbacks over the last few months. Porky began performing publicly in his mid-teens, and studied with the legendary Miff Mole at that time. At age 19 he began playing with the Charlie Barnet Orchestra, where he was often featured as a soloist. Stints with Tony Pastor and Glen Gray's "Casa Loma" Orchestra followed, and in 1948-a time when segregation was the rule even in the jazz and blues worlds-he was one of a few white musicians to perform with the great, swinging Lucky Millinder Orchestra, a band which spawned blues shouters Wynonie Harris and Bull Moose Jackson. After marrying and "settling down," he limited his performing career to local gigs in Rhode Island and southeastern New England; however, upon retiring from record sales, he joined the great jump-blues band ROOMFUL OF BLUES in 1981, touring all over the U.S. and Europe, giving people another taste of his big, effusive and exuberant sound. During this phase of his career, he recorded with jump-blues greats Big Joe Turner, Eddie "Cleanhead" Vinson, Jimmy Witherspoon and Earl King. However, by 1987 he had had enough of the rigors of constant touring, and returned to Providence and various bands in that area. He continued performing until increasitg ill-health sidelined him late last year. 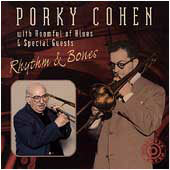 Porky Cohen, dead at 79. Most musicians are happy to have one career. Cohen had at least two. From 1942 to 1950, he hit the road with the big bands of Charlie Barnet, Lucky Millinder, Benny Goodman and more. Cohen came back to Rhode Island and played with the Dixieland band The Jewels of Dixie, and also worked at Ladd's Music, in Cranston and later in Providence. "He did the road on his terms," says local jazz writer and photographer Ken Franckling. "He didn't stay out long enough to get jaded on it, and he knew that there was more to music than spending your life on a bus. . . . He came home and got a real job. Some guys never get off the bus." Hal Crook, 53, an area trombonist who has recorded and toured the world and teaches at the Berklee College of Music, started taking lessons from Cohen at Ladd's at age 13. "Basically, the guy gave me everything in terms of my musical foundation: How to get a sound, how to play Dixieland -- he's like the godfather of Dixieland, rhythm-and-blues trombone playing. . . . I made my bones playing in his band, the Jewels of Dixie." But Cohen and the road weren't through with each other. In 1979, he got the call to join Rhode Island's rhythm-and-blues stalwarts, Roomful of Blues. "He joined [Roomful] at 54," said Carl Querfurth, who eventually replaced Cohen in Roomful in 1988. "I'm 48 and I left the band five years ago. I said, 'I'm too old to be doing this.' He joined when he was six years older than I am now!" Bob Bell first saw Cohen and Roomful in Atlanta in 1980. "When we walked in, they were playing (the Duke Ellington tune) 'Caravan,' and that was Porky's feature number with the band. And that was my very first glimpse of Roomful of Blues and Porky, walking through the door of this club. There were people literally dancing on the tables. Dancing on the tables! And there's this old guy playing trombone, the eyes bulging out of his head, and I thought 'Wow! This is just fantastic!' "
Bell started talking with Cohen during the break, and a few months later he began working with the band. He managed them for 23 years. "He really had a very down-to-earth, professional attitude toward playing," Bell said. " . . . He knew the value of space; he wouldn't play extra notes. He played what fit the song." John Rossi, the band's longtime drummer, said Cohen was "really the most professional musician he'd ever played with," according to Bell. According to Querfurth, Cohen appeared on several Roomful records, including Hot Little Mama, Live at Lupo's and Dressed Up to Get Messed Up, as well as those the band did with Big Joe Turner, Earl King and Eddie "Cleanhead" Vinson. Cohen also played on a Charlie Barnet 78 from the '40s. And in 1996, he released Rhythm & Bones, his only solo album, which was produced by Querfurth and featured the members of Roomful as his backing band. "He got a little piece on each of the Roomful records he was on, but I wanted him to have a whole record to lay it out on. So I just said 'If you had a record, what would you do with it?' "
The result is big-band rhythm and blues, with a swinging feel and with Cohen leading the way. After leaving Roomful, Cohen played around Rhode Island for the rest of his life, on a freelance basis and in the band Swingtime with John Worsley. People best remember him for his work with Roomful of Blues, but swing and big-band music was his first love, Worsley says. "He was greatly respected throughout the music business, not just in Rhode Island," Worsley says. Cohen was a friend and mentor to a young Doc Severinsen in the Charlie Barnet Band (which also included Clark Terry) in the '40s. Last year, Severinsen, who went on to fame and fortune with the band on The Tonight Show with Johnny Carson, played in Providence with the Rhode Island Philharmonic. Worsley says he tried to get Cohen to come to the show, but Cohen was too ill.
Worsley went to the show, and sent a note backstage to Severinsen. The written reply was swift: "Make sure you get back here." "We went into his dressing room and he closed the door. . . . He said 'I wanna hear about Porky.' "
Worsley and Cohen were supposed to work together last New Year's Eve, but they were both ill. Worsley believes that Cohen's last gig was with him for Autumnfest in Woonsocket last October. And as Worsley says, that required a little reverse psychology. "He said, 'John, I don't think I can do it.' So I said, 'Well, just come and watch, and support me.' So he said he'd do that. And I said, 'Do you want to bring your trombone?' 'Yeah, if I'm gonna go, I might as well take my trombone.' Then, when he was there, I said, 'Now, Porky, you don't have to play anything, but do you want me to take your trombone over to the stage or should I just leave it here in the car?' and he said 'No, if I'm gonna go over there, I might wanna play a few notes.' . . . And the music started and away he went. . . . Well, of course he just blew the walls down. And the other players in that band just sat there in amazement at him." "He really could blow. Even as frail and sickly as he was, when he took a solo, watch out." 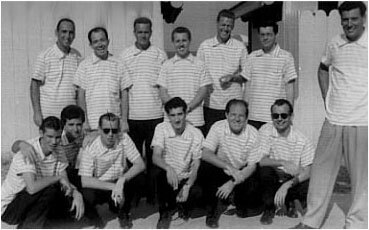 The Picture was taken in Virginia Beach of The Commanders band (1955). The top picture at the top row is Morty Trautman, Porky Cohen, Al Loraine, Felix Mayerhofer; [the trombone section] Teddy Napoleon, piano, Griff Howe, guitar. Eddie Grady is standing. Front row: Jim Gannon-Bass; Paul Gaglio-alto; Lou Lindholm-tenor; Mario Bonafidi, Al Mullins, Willie Gillette-trumpets.